Darla Turano takes a break from cleaning to relax and enjoy her pest-free lanai. 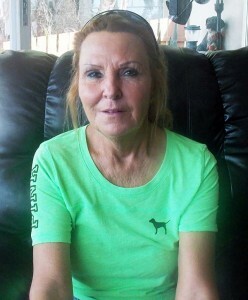 Darla Turano has lived in Naples for 15 years and has used the services of Collier Pest Control for 12 of those years. She didn’t start using their services because they were recommended by a friend or neighbor. She just got lucky when she found them in the yellow pages. But since then she has recommended them to many people in Southwest Florida. Darla has had a couple of pest problems over the years. One is ants. She says they appear when there’s too much rain or when there isn’t enough rain. Darla’s home is immaculate. Obviously she practices her cleaning skills at her own home. However she once had a very embarrassing problem: bed bugs. “Once we discovered bed bugs on the couch,” explains Darla with a whisper. “It appears that my grandson had brought them home in his baseball cap, of all things. Bed bugs (or the eggs) can show up in even the nicest homes – brought in on furniture, mattresses, clothing, even the bottoms of shoes. It can happen to anyone and is nothing to be ashamed of. However, it certainly is a problem that needs the attention of a professional pest control company. And it often requires multiple treatments. Another time she saw signs of carpenter ants. Collier Pest Control came right out and found the source: the attic. Problem solved. “I have worked with a few technicians from Collier Pest Control. William was the first one I had at my home; now I have Richard. And I have met other technicians when I am at clients’ homes cleaning. I have found them all to be courteous and professional. “Once Richard even saved by 14-year-old granddaughter from being injured when two new puppies got into a fight in the back yard and she was trying to separate them. Richard was here treating the house, heard the commotion and ran out there to rescue my granddaughter and separate the dogs. He went beyond the call of duty for us and I’m so grateful. Click Below to hear what Darla Serrano has to say about Collier Pest Control.